12th August, Jakarta: World Champion, Biboy Rivera of the Philippines brought home a convincing victory over challenger, Wu Siu Hong of Hong Kong to capture his first-ever tour title at the concluding ABF Tout Indonesia leg at Jaya Ancol Bowl while Malaysia's Lai Kin Ngoh celebrated a double after emerging as Women's champion. Local favourite, Putty Armein and Wu Siu Hong again played second fiddle when Armein lost to Lai Kin Ngoh and Wu lost to another Malaysian, Alex Liew in the same last year. At the start of the men's final match, Biboy Rivera opened account with a double as his opponnent, Wu Siu Hong had an opened frame. Disaster struck again in the third frame for Wu while Rivera made no mistakes to take the lead. Wu just could not repeat the form he displayed during the semifinals when he disposed off top Indonesian contender, Ryan Lalisang, 234-214 in the semifinals. He went on to finish a disappointing 168 as Rivera romped home another comfortable victory with 209 to claim his first-ever tour title. "After the Doha Asian Games, I had to rest more than two months to nurse a kneel injury," said the delighted newly-crowned champion. "I only started to train intensively a month ago and maybe I'm fresher. "Match against a tough opponent like Wu is not easy as he always perform well in competition like this tour. I'm delighted that I can finally win a tour title," added the 2006 Men World's Championship Masters gold medalist. The champion had reached the finals after he denied another Hong Kong challenger, Daniel Yiu, 257-208 in the other semifinals. Rivera was equally impressive taking out Korea's Han Ji-Hoon, 214-188 in round 1 and Thailand's Yannaphon Larpapharat, 257-205 in round 2. In the women's division, Lai Kin Ngoh of Malaysia celebrated a double when the ex-national defeated local favourite, Putty Armein of Indonesia, 216-188. Lai had again denied the Indonesian at the same leg last year. Both started the match cautiously but an opened frame in the third from Putty gave Lai some breathing space. But Putty recovered to knock down three consecutive strikes to take a slender lead at the halfway mark. Lai then went into overtime to two double strikes to end the match with 216 which put pressure onto her opponent for which she had no answer to hand the title to Lai with 188. 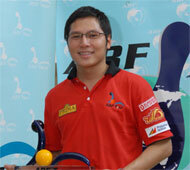 The champion had reached the finals by beating Hong Kong's Chan Shuk Han, 197-174 in the first semifinals. Putty earned a crack at the title knocking out current Asian Ranked No. 1, Kim Eun-Jung of Korea, 212-205 in the other women's semifinal match. "I'm so surprised that I can win the title two years in a row," exclaimed the champion, who now resides in Hong Kong after quitting the Malaysian national team last year. "I bowl alot less these days but I practised hard just before this trip and I'm glad my hard work paid off. The final leg of this year's tour will be in Hong Kong on September 22. The top 16 highest ranked in both the men and women division after the final leg will make the cut for the ABF Tour Tournament of Champions which will be held in January, 2008. Highlights of the ABF Tour Indonesia leg will be televised later on local television stations of the eight countries where the tour is being held.